You do a lot to keep your family healthy, including making smart choices about the food you buy. And chances are, you’d buy everything organic if you could. But for most moms, a totally organic kitchen isn’t realistic, considering the items can cost upward of 50 percent more than their conventional counterparts. “We all need to prioritize our purchasing based on what’s important to us,” says eco-cuisine expert Jackie Newgent, a registered dietitian and the author of Big Green Cookbook. Your first priority may, obviously, be to provide your family with plenty of healthy fruit and vegetables, calcium-rich dairy, and whole grains — organic or not. Beyond that, however, Newgent and other experts say that if and when you can budget for a few organic goods, certain picks are worth the cost. Check out this shopping guide to help you know where to allocate your organic dollars and where to save. When it comes to pesticides in produce, not all fruits and veggies are equal. Certain types are exposed to and retain more chemical residue than others, even after washing. The worst offenders — aptly nicknamed “the dirty dozen” — include peaches, apples, bell peppers, celery, nectarines, strawberries, cherries, lettuce, spinach, imported grapes, carrots and pears. “If you want to buy organic but have a limited budget, spend it on these,” says Colleen Doyle, a registered dietitian and the nutrition and physical activity director for the American Cancer Society. Produce that has thick skin, on the other hand, is usually the least tainted, says Christopher R. Mohr, Ph.D., R.D., a nutrition expert based in Louisville, Ky. The outer covering acts like a shield, protecting the edible portion from pesticides, so paying extra for organic isn’t necessarily worth it if you’re on a budget. In other words, much of the chemical residue that may be on foods like bananas, pineapple, melon, kiwi, mangoes or avocados likely ends up in the trash along with the peel anyway. And despite not having thick peels, broccoli and cabbage also tend to retain among the lowest levels of pesticides, says Doyle. “Organic milk and other dairy products are worth the extra cost whenever possible,” says Dr. Christine Gerbstadt, an anesthesiologist and registered dietitian, and a Sarasota, Fla.-based spokesperson for the American Dietetic Association. This is especially important for women and children who tend to eat and drink a lot of milk for its calcium. The government’s organic stamp signals that milk-producing cows were not exposed to pesticides in feed, nor were they given antibiotics or artificial hormones. Gerbstadt and others recommend organic because they’re concerned that the use of antibiotics in livestock could potentially contribute to strains of drug-resistant bacteria that may affect humans. Equally worrisome is the hormone given to some cows to increase milk production — called recombinant bovine growth hormone, or rBGH. Although studies have found no significant difference between milk produced with rBGH and that without without, Gerbstadt and other experts recommend erring on the side of caution and avoiding it entirely. That way, there’s zero risk that any trace amounts of artificial hormones from milk will enter your — or your child’s — system. If the cost of organic dairy is prohibitive, you can find nonorganic milk without rBGH — the next best thing. Look for terms like “rBGH-free” on labels. Not all manufacturers put this information on their labels, however, so if you have a favorite brand, call the company’s customer service number or visit its Web site to check. With all the various terms that can appear on egg cartons, choosing what’s best for your family can be especially difficult. The bottom line: It’s OK to buy an inexpensive, nonorganic option to save money. All eggs, organic or not, are rich in nutrients and high-quality protein, says Newgent. For starters, you needn’t worry about growth hormones like those sometimes given to milk-producing cows. “Egg-laying hens in the U.S. are not given hormones, additives or preservatives,” she says. Furthermore, eggs produced by chickens that were raised on nonorganic feed don’t pass on pesticides to you, she confirms. Finally, it’s also not necessary to pay extra for brown eggs; shell color has no impact on quality, nutritional value or flavor. “Eggs are fantastic for you,” reiterates Mohr. “They can be one of the least expensive sources of protein in the whole grocery store.” And because organic cartons tend to be so much more expensive — often $2 or more above the cost of conventional — practicality trumps any potential benefit you’d get from organic, he says. Bread, cereal, pasta, cookies — you’re faced with a plethora of organic choices elsewhere in the grocery store too. But the majority is not worth paying extra for, since grains generally have low concentrations of pesticide residue to begin with. “They do not need as many pesticides [when growing] as other foods,” says Mohr. One exception: rice. 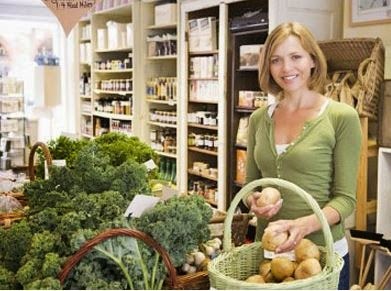 Buying organic makes sense since it can contain higher levels of pesticides. (Rice is grown in water, which carries more pesticide particles than soil.) Luckily, though, organic rice won’t bust your budget: It’s nearly as inexpensive as conventional, especially if you buy in bulk. You’re used to budgeting for the things that benefit your family most. And buying organics only when those benefits outweigh the cost is the best way to keep both your family and your finances healthy. Before you go visit THIS LINK to get your FREE Commando Kit from Cottonelle. Should Spanking be Used as a Form of Child Discipline?